Cute strategy with dire consequences. 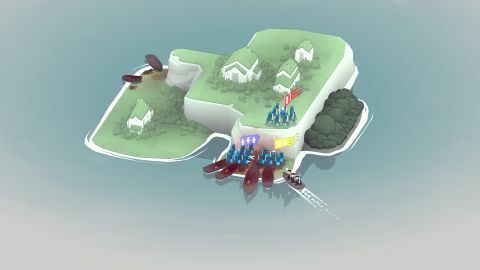 Mostly delightful and sometimes punishing, Bad North is a fun alternative to more complex strategy games. What is it? A Viking-themed, tile-based real-time strategy game. Do not be fooled by the cute sound effects or adorable sprites: Bad North is not a lovely new friend. It's here to steal your time, beat you up and possibly burn your house down. At least, I wanted to burn everything down after I lost all my progress to a silly mistake for the third time. It's a simple strategy game, almost closer to being a puzzler. You have to defend a little square island, or more specifically, the little cottages dotted around it. You have up to four units to hold off waves of Viking invaders. Bad North is about shuffling units around to make sure someone is on the beach ready to greet approaching enemies. Complications arise with more frequent waves and various enemy types requiring different units to counter. The real key to each battle is teasing out the choke points on the islands—placing your troops where they can make the biggest difference without wasting time marching them from one end of the island to the other. It lures you in with some breezy opening missions. Slow waves of opponents, easy odds, basic islands with clear layouts. Soon, a mission that looks the same as the last few has just one extra wave, one new type of foe, just a little extra something to catch you off-guard. You realise your progress has been crushed because of one bad decision, sending you back to start the campaign all over. Your units are only groups of eight or so little dudes, and with each fight they diminish. You need to send them to a house to replenish or risk losing them forever, but while they're recovering their numbers they're unable to respond to any attackers. Making the call at the wrong moment will cost you dearly. Lose all your units and it's game over, right back to square one. It's an extremely harsh punishment for a game with such a gentle presentation. Moving troops feels like playing with a small box of toys. The soft wind and waves make each island feel like a lovely little haven, the cottages dotting the islands adding to the wholesomeness. It's all so simple and evocative. Sure, some ominous music plays and there's some blood stains after a battle, but it barely registers when the rest of what's on screen is so nice. It's hard to determine whether the deceptive nature is part of the point or harms what initially seems like a pleasant, laid back strategy experience. You respond to oncoming attackers carefully but easily—a nice alternative to more demanding strategy games. Yet that all turns on a dime with one single mistake. The consequence of failure feels at odds with the leisurely pace of combat. There is a campaign map, randomly generated with each new game, to worry about between missions, where you apply upgrades and choose what island to tackle next. You get more rewards depending on how many cottages survive at the end of a level. You use those to level your units, allowing you to specialise into pikemen or archers, and pick special abilities like a diving attack from clifftops. It's all pretty straightforward but, like the missions themselves, doesn't suffer mistakes. Pick the wrong island or ability then tough, that's it, no do-overs. Bad North is currently only available through Discord, which caused me some problems when first trying to play the game. Many seem to be able to launch without issue, but Bad North did not work for me at first—and with no error message to explain why. When it did start working, it did so without reason or explanation. I also experienced a few crashes over around a dozen hours of play. Nothing major, but frustrating all the same. If you can stomach the harsh consequences for failure then Bad North is a great little strategy game, perfect for playing on a break or in short bursts. I keep restarting in spite of the failures and the resets, so that probably speaks volumes for how compelling it is. There's just something about watching those little sprites batter each other that keeps me coming back. At least until I burn my house down.